In the 42nd session of Chandoo.org podcast, Let’s talk about money. 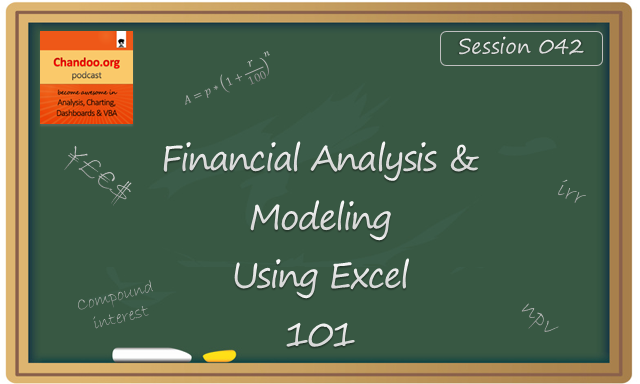 We are going to learn about various concepts that are vital for doing financial analysis and building models. What is in this session? Click here to download the MP3 file. Please click here to download the Uber vs. Your car analysis workbook. NPV – what is it and how to calculate it in Excel? IRR – how to calculate it? CAGR – how to calculate it? Cost vs. benefit analysis – which bulbs to use? How much money you need to retire? According to you, What are key concepts for financial analysis? I shared my opinion and explained 5 concepts in the podcast. Now its your turn. Tell me what are the key concepts to master if someone needs to learn about financial analysis & modeling? Please share your thoughts and inputs in the comments section. I encourage my clients to focus on NPV rather than IRR. After all, IRR is simply the discount rate that makes NPV equal to zero. If I tell you that a certain investment will provide an IRR of six percent, you will probably ask me if that is a good return. My answer will be that it's a good investment if your cost of capital (expected return on an investment of equal risk) is less than six percent. Of course, if you knew your cost of capital, you would simply use that as your discount rate in an NPV analysis.